The Grand Ludovisi Sarcophagus was found in 1621 near the Porta Tiburtina, one of the eastern gates of the city of Rome. It was named after Cardinal Ludovico Ludovisi (1595-1632), who was an avid collector of antiquities. The sarcophagus can be dated to around 250-260, so it is a little younger than the Portonaccio Sarcophagus discussed previously. The sarcophagus can be admired today in the Palazzo Altemps, which is named after Cardinal Mark Sittich von Hohenems (1533-1595), who was Pope Pius IV’s nephew (see Santa Maria in Trastevere; “Hohenems” became “Alt-emps”). The Palazzo is one of the four locations of the Museo Nazionale Romano. 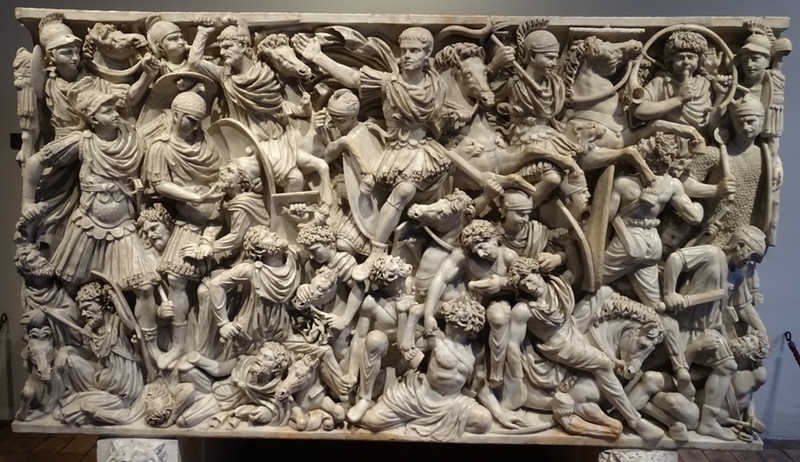 As with the Portonaccio Sarcophagus, it is not known who the sarcophagus was intended for. The information panel in the museum offers two options: either Hostilianus or Herennius Etruscus. Both were sons of the emperor Decius (249-251). 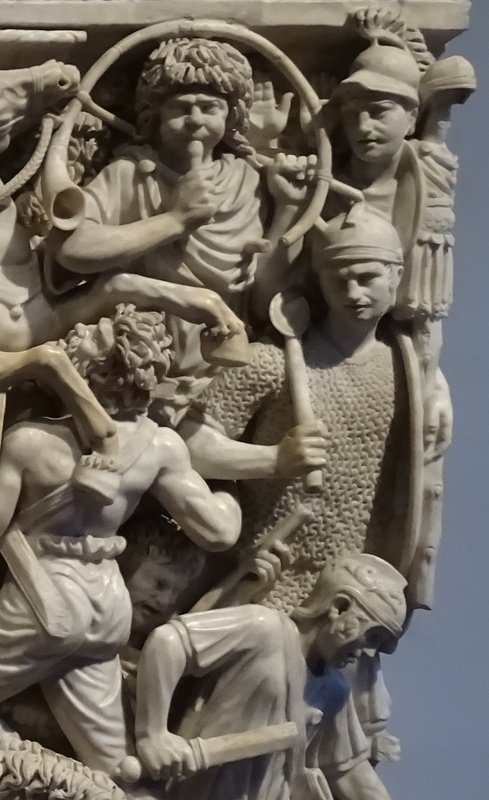 Decius, known for his persecution of Christians, died in battle against the Goths when his army was defeated at the Battle of Abritus in the summer of 251. He was the first Roman emperor to be killed on the battlefield. His son Herennius was with him and was also killed. Their bodies were never recovered. Hostilianus had stayed behind in Rome because of his inexperience and died of the plague later that year or the next year. 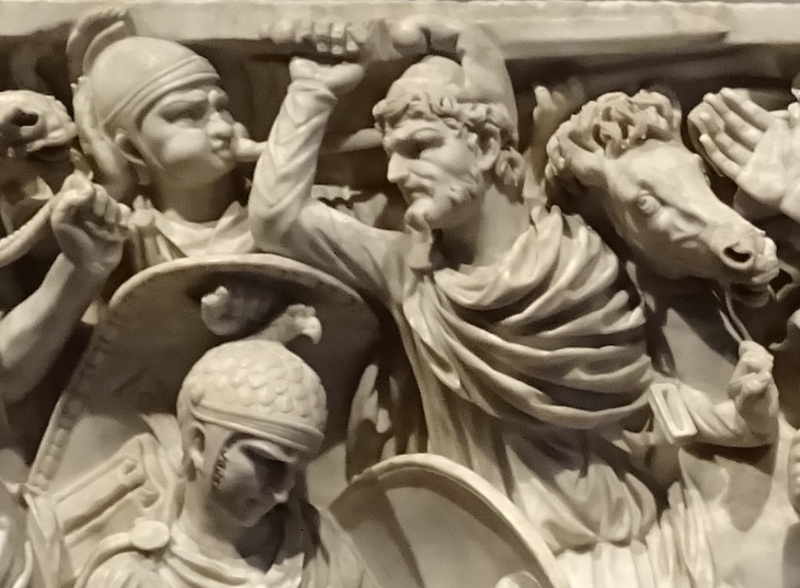 On the front of the sarcophagus, we see a battle raging between the Romans and ‘barbarians’, presumably Goths. 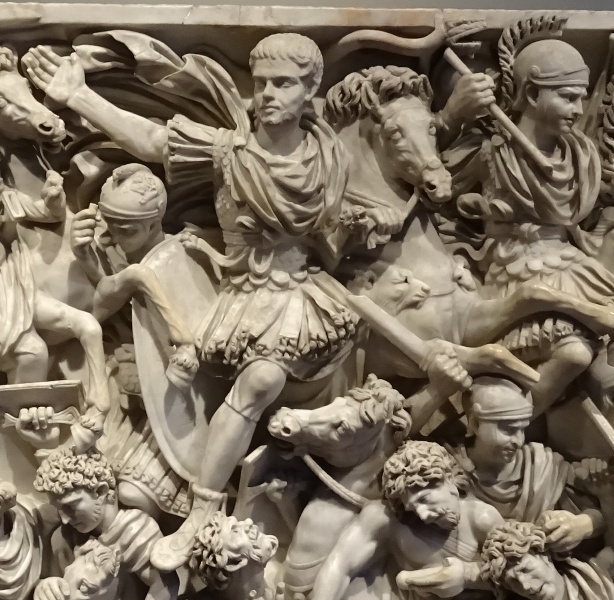 The Roman horseman in the centre is most likely the deceased (image on the right). He is not actually participating in the battle: he is bareheaded and not even armed. The deceased has a thin beard. Most of the other Romans in the scene are clean-shaven. Gone are the days of the full beards that were popular under the emperor Hadrianus and his successors. Of course the barbarians in the scene do have lots of facial hair and they all die rather dramatically. Many commentators have mentioned the X on the deceased’s forehead and have argued that this marks him as a follower of Mithras, a deity that was very popular with soldiers. One source even claims that “behind his head emerges the serpent of the god”. That claim is ridiculous: the so-called serpent is in fact a draco, a dragon standard used by the Roman cavalry. I am not too sure about the Mithras claim either since so little about the Mithraic religion is known with certainty, but will admit it is a possibility. A very interesting feature of the sarcophagus is that it shows two junior Roman officers with musical instruments. These were of course not primarily used for entertainment, but to communicate military commands like “advance” or “retreat”. To the left of the deceased is a tubicen, with most of his tuba hidden behind the horseman with the sword to his right. Look at the man’s cheeks filled with air (image on the left): he is really blowing his tuba. A lovely detail no doubt added by a master sculptor. The other officer can be spotted to the right of the deceased and can be identified as a cornicen. He plays the cornu, a kind of horn. Just below the cornicen is a Roman legionary wearing a long chainmail shirt. Mail armour has been used by the Roman army in every period of its existence. It offered reasonably good protection against sword and spear thrusts and was relatively easy to maintain. During the early Principate, a new type of armour was introduced which modern authors call lorica segmentata. It is a form of segmented plate armour that offered better protection than chainmail and was also a little lighter. A full set of chainmail could weigh up to 10 to 15 kg, while a set of lorica segmentata would be around 9 kg. The problem with the lorica segmentata was that it required lots of maintenance. This was probably one of the reasons to abandon it during the third century (see Goldsworthy, The Complete Roman Army, p. 126-129). It can still be seen on the Portonaccio Sarcophagus and Marcus Aurelius’ column, but it is notably absent on the Ludovisi Sarcophagus. The legionary in his chainmail shirt is probably a signifer, a standard-bearer. He has the pole of the standard slumped over his shoulder and one of the medallions (phalerae) on the pole is visible. The rest of the standard is missing.